I’m not quite Victor Kiam when it comes to the iPhone – I haven’t yet bought Apple, as far as you know – but I’m a serious fan of the product. Enough that I spent my own, not RedMonk’s, hard earned dollars to upgrade from a first generation to the recently released 3GS. To own the truth, however, I didn’t buy it for the phone, because frankly as a piece of hardware, it’s flawed. It’s marvelous and ground-breaking and all of that, true, but let’s be honest: it’s a bit large, the lack of a keyboard can be problematic and the battery life still isn’t great. Why did I shell out better than three hundred dollars of my own money in a down economy then? 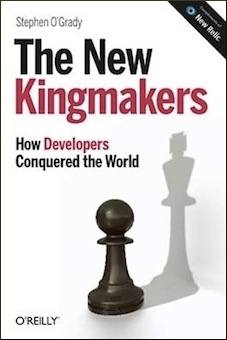 The developers, of course. Ballmer’s throat-damaging “developers, developers, developers” fit might have fully transcended into the realm of cliche, but as someone once said: cliches are cliches for a reason, and it’s not because they’re untrue. Much has been made in some quarters of the problems with Apple’s app store gating policies, and rightly so: they’re fundamentally broken. Nor is the development of the applications themselves any picnic. Or maybe you enjoy learning Objective-C? And yet the App Store is the single most compelling and commercially successful application catalog in existence; I’m not even sure who would be second. 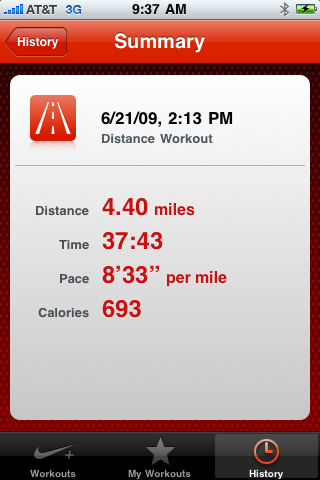 The store launched July 10, 2008. By April 23rd of ’09, Apple had sold a billion applications on behalf of their creators. And as of three weeks ago, those creators had put 50,000 applications up for sale in the marketplace. That kind of traction is incredible and transformative. Remember that, at its core, the iPhone offers not a whole lot more than a phone, browser, camera, iPod and GPS. Which, ok, is kind of impressive. But not truly differentiating, Apple’s acknowledged strength in user experiences aside. As good and smart as Apple is at design – and they are very, very good – they’re never going to be as good and smart as everyone else. We see this in the enterprise world frequently, where vendors that foster an ecosystem succeed and those that don’t, well, don’t. But we haven’t seen too many examples of this play out in the consumer world yet, which is one of the reasons the iPhone is such an interesting platform. With the App Store, Apple’s attempting to cement its role with a community play. And at least with this customer, it’s working. Well. Is it interesting that Apple’s continued to update the platform with features like video? Sure, if you enjoy seeing my cat chase a laser pointer around the office rug. Far more interesting though, I think, is the degree to which other developers and vendors have extended the platform. 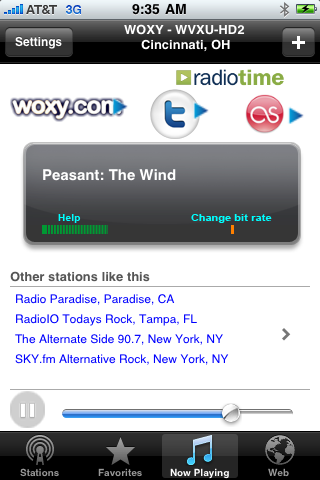 For example, there’s WunderRadio, brought to you by the good folks from WunderGround. The only radio station that I listen to you, as some of you know, is WOXY, an absolutely tremendous Indie Rock station out of Cincinatti. But as I don’t live in that geography, I’ve previously only been able to listen to it while at the office via internet radio. WunderRadio, however, changes that, giving me the ability to listen any time I want. The runners in the audience might be aware of Nike+, which while certainly not exclusive to the iPhone, unquestionably extends it. 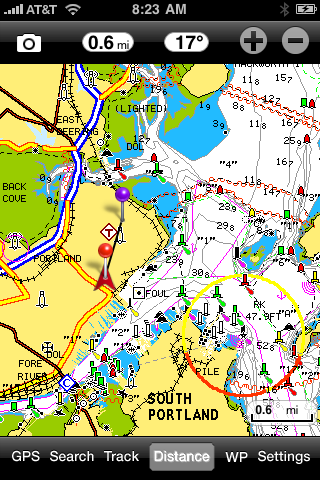 Boaters, on the other hand, are probably very familiar with the expensive marine GPS units like the Garmin we have for our Triumph up here in Maine. Guess what $5 will buy you from the App Store? A pretty credible alternative to those $800+ devices. The travelers in the audience, meanwhile, probably have seen flight tracking applications before. But how about one that syncs with TripIt? 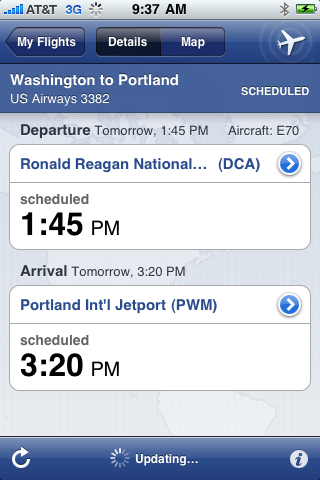 With FlightTrack Pro, all of my flights are tracked automagically. With a few Gmail rules, I’ve set incoming flight confirmations and itineraries to auto-forward to TripIt, where they are processed and then synced to FlightTrack Pro. All with zero effort from me. By far the best development for me, however, was the recent iteration of MLB’s AtBat iPhone application. Useful last year as a means for tracking games down to individual pitch locations and velocities, this year’s edition was – as mentioned – the best $10 I’ve ever spent on software. First, it introduced gameday audio. So whether I’m walking down the street in San Francisco or cruising through the Portland Whole Foods, I can take the Red Sox game with me. And as if that wasn’t enough, they’ve gone and launched live video streaming of select games per day. Granted, it’s only a few games and they are still subject to MLB’s positively asinine blackout rules, but think about it: you can watch the game on your phone. And the choppy picture below notwithstanding, the quality is really not bad: I seriously feel like I’m living in the future. All of this, of course, reflects my interests: yours are likely to be very different. Which is the point; with 50,000 applications available and growing, if you can’t find something that interests you, you may want to rethink your interests. Want to see satellite images of the RedMonk Portland office? Done. Learn Spanish? Yup, they’ve got that. Hell, you want to know what the tide schedule is up in Robinhood Cove? All set. The point here is not to try to sell you on an iPhone. It is rather to point out that, as we’ve known for years, developers and developer traction can and probably will make or break your product, presuming it has platform ambitions of any kind. Because it reframes the debate; Android, Pre and the likes aren’t simply competing with the iPhone any longer, at least not for me. They’re competing with the iPhone and every application that runs on it that improves my quality of life. More, as we’ve seen with Windows, the network effect comes into play, as the larger and more successful the market becomes, the more compelling it is for developers in a self-fulfilling cycle. It all kind of makes you wonder why this lesson is proving so hard for enterprise vendors to learn. But no matter; I’m just happy that at least Apple understood the potential of a marketplace. Agree with you 100% on the MLB At Bat app. Absolutely love it. And I’ll have to check out the TripIt and flight tracking you mention. Another great app I actually paid for is iCam. Using just your home computer and a web-cam, you can have a quick and dirty home surveillance system. Another upcoming app that may push me that much closer to getting an iPhone is the GPS one that TomTom is planning for later this summer. Basically getting a GPS for traveling for $50 sounds like a great deal to me if it works even halfway well.